Shelter from the storm pre-start with HARRC support runners. 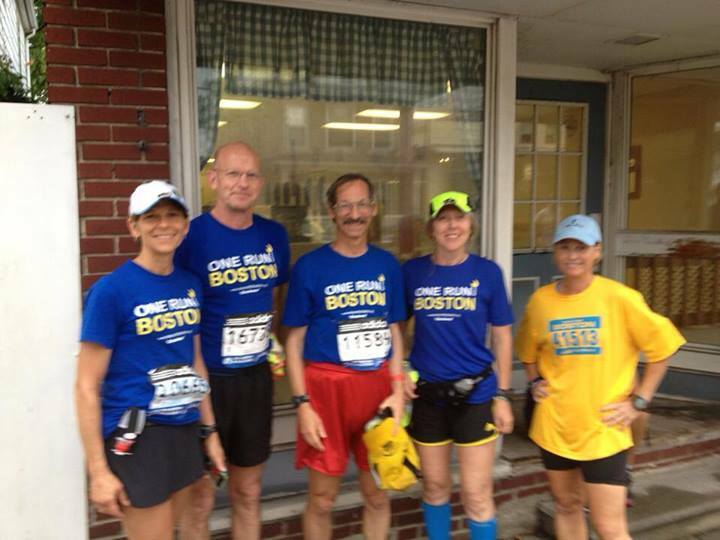 See histories on One Run for Boston Leg #269 link. The race organizer in me wants to know how the relay points were coordinated. Was there anything other than the live internet feed that let you know when the immediate relayer from the west was approaching? Megan Capuano, Leg #268 Runner hands off the baton (aka ‘Miles’) at Reedsville. The organizers provided the start and end points for each stage, and the lead runners were tasked to identify the best (but in some cases, not the shortest) route and post it on the Web on the page individuals joined up. Stage leaders communicated by text and cell. The race organizers for some stages (but not all) had a support vehicle that kept in touch with the “live” stages as well as those just ahead, and I had sufficient notice that our stage was about to begin. Overcast skies but the worst of the weather had passed. Tell us about the hand-offs, start and finish of your leg of the relay. Our stage started 80 minutes late, partially because the previous stage ended up being 14 miles rather than the 10 anticipated. 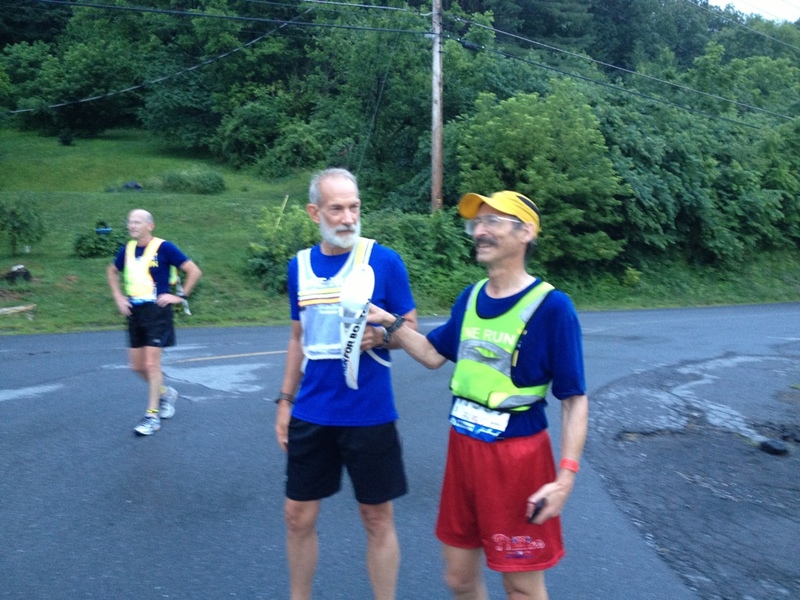 There was a ceremonial handoff with lots of pictures at the end of each leg. At the beginning of our stage, we were joined by a pack of supporters, including the Juniata Valley Striders and Mifflin County Huskies Cross Country team, who escorted us for the first two miles. The torrential rainstorm we experienced driving up magically disappeared, and we started off at a comfortable 9-minute pace and kept that pace during the entire run. The end of our stage was uneventful, as I handed off to Joe Church, who lost his wife this year, and is dedicating his runs to her memory. I recently participated in Joe’s successful effort on a local high school track to run 100 miles in 24 hours, raising money for cancer research. Awesome guy. In my experience, every run has one strange, odd happening that makes it stand out from others. What experience will you most remember from this relay? Perhaps the most memorable for me is a photo taken of Scott Falkner, running by himself two stages ahead of ours. There was a torrential downpour. Trees were down, and roads flooded. 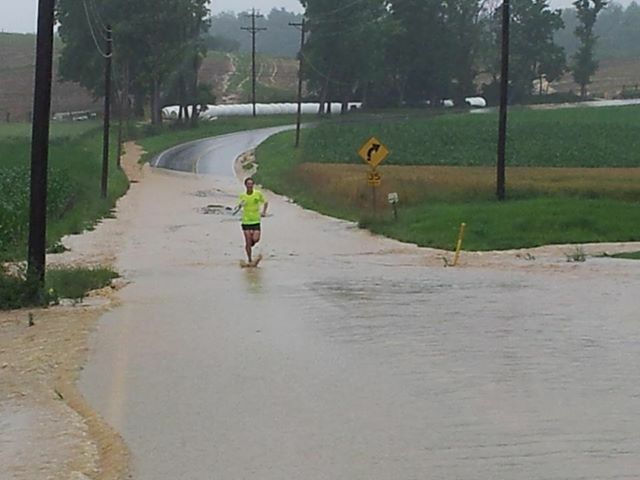 The photo shows Scott charging into what appears to be serious road flooding. I found it symbolic of how strong-willed runners can be, overcoming life’s challenges. You have quite a posse running with you. Other than being good company and strong runners, were they helpful in setting up the logistics, following your route etc? The support provided by those from my stage and from other stages, and the race organizers, was quite incredible. There was an entire community of over 900 runners on the nonpublic One Run for Boston Facebook page that was only open to participants. I felt that I was part of a family, willing to make whatever sacrifices were necessary to keep the baton (aptly named “Miles”) moving toward Boston. The event was an impressive display of determination by the running community to keep the memory of the Boston tragedy alive, and honor the memory of the victims and survivors by raising money for their support. 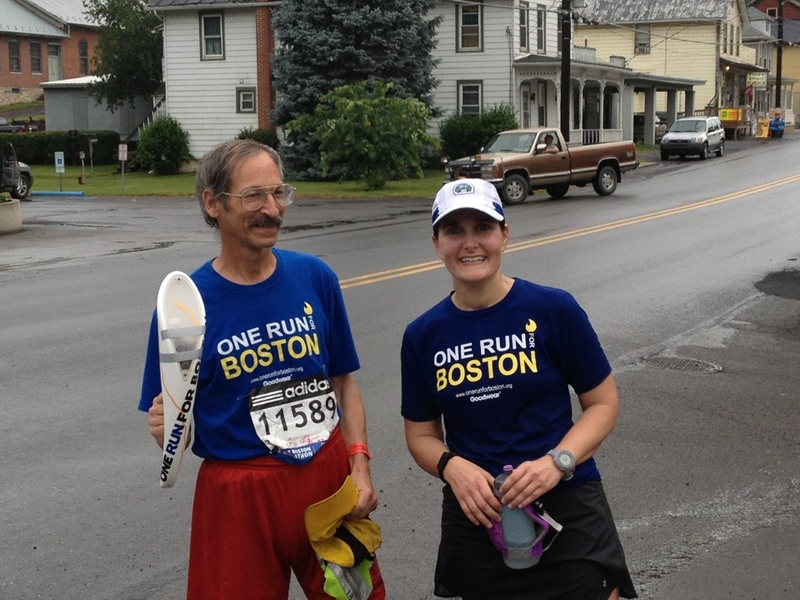 Donations for One Fund for Boston can be made through the One Run for Boston website. You’re welcome. This was an amazing organizational triumph and raised lots of $$ for One Fund for Boston.